Big screw pole pieces provide a unique look. Warm 7.5 kOhms neck and screaming 15 kOhms bridge provide a unique sound. Four conductor cable allows for "in series", "parallel", and "coil-splitting" wiring options enabling you to experiment in finding your tone. 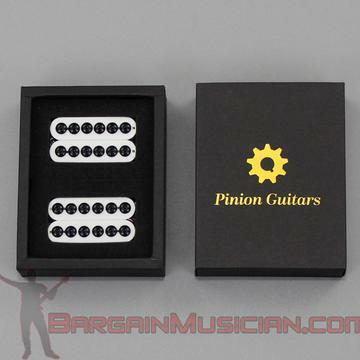 Pinion Guitars was co-founded in partnership with Bargain Musician to provide for customers requesting premium pickup options at our warehouse direct low pricing.